The New Humanitarian | Is sustainable agriculture possible in the Sahel? Is sustainable agriculture possible in the Sahel? With drought conditions chronic in the Sahel, many farmers give up trying to grow crops and head to towns and cities to find work. In Chad many go to the south or to Lake Chad where irrigation from the fast-shrinking lake is used to farm. But some agro-ecologists say governments, donors and farmers should not abandon agriculture in the Sahel, and despite being “very difficult”, with the right approaches, there is “huge potential” in natural regeneration, traditional irrigation methods, and simple alternatives such as crop diversification. “The Sahel has enormous potential - this is a very marginal food-growing environment, so we are forced to learn how this natural system works. All we’re doing is looking for the clues in nature,” said Tony Rinaudo, a research and development adviser on natural resources to World Vision Australia who worked in the Sahel for 19 years, practicing agro-forestry, a traditional land-use system that combines trees or other woody perennials with crop and animal production. The Kanem and Bahr el Ghazal regions in western Chad are chronically food insecure, and periodically experience acute malnutrition rates above the emergency threshold. According to NGOs, rates reached 19 percent in Kanem earlier in 2012 and many families have already run out of food and are down to one or two goats. Both regions are dotted with fertile oases, known as ‘wadis’, that have for years been left by their traditional ‘owners’ - the aristocrats, or ‘Sultanate’, and village chiefs - to grow little more than date palms, lemon and mango trees. Vegetables are systematically grown in just 100 of Kanem’s 500 wadis, according to the Food and Agriculture Organization (FAO), which runs a project with the European Union (EU) humanitarian funder, ECHO, to help the poorest families grow vegetables in 120 oases across Kanem and Bahr el Ghazal. “Here [in Kanem] one crisis just flows into the next one… but we are trying to keep people here and to see how we can enlarge the wadis further,” said Abdul Karim, FAO’s food security head in Mao, the capital of Kanem. Sultanates and village chiefs lend the oases to separate producer committees of men and women for 5 to 10 years, while FAO helps build a water point and provides the pump, gives farmers seeds and tools and trains them in market gardening. Minder Mohamed Ali was guarding fields of lettuces, carrots, aubergines and onions in Aloum 2 wadi, 8km from Mao. “We eat some, we sell some of the vegetables - many farmers weren’t able to do much before this, as they have had no production this year,” he told IRIN. With the right level of investment and the right approach, anything is possible, said Augustin Ilunga, head of the UN Children’s Fund (UNICEF) in Mao, which has for decades been helping to keep severely malnourished children alive. “In a desert landscape like this, with climate change, it will take a lot of work to change… but with the right attitude it’s possible. Otherwise we’ll be here giving Plumpy’Nut [a highly nutritious foodstuff given to malnourished people] forever,” he told IRIN. Niger too is prone to drought and food insecurity, and parts of the country have high malnutrition rates, but there has been some success since 1985 in re-greening parts of its desert landscape - an estimated five million hectares - which environmental writer Mark Hersgaard has called “one of the great success stories in the field of climate change and agriculture”. NGO World Vision was part of the project, helping farmers move away from destructive slash-and-burn farming techniques in the south-central Maradi region to agro-forestry. Preserving trees protects sandy soil from erosion caused by the strong Harmattan winds that blow across the Sahara, as well as heavy downpours in the rainy season; while also restoring soil fertility by producing biomass, says the International Fund for Agricultural Development (IFAD). The results have been impressive. Farmers who shifted from growing only millet to agro-forestry are collectively producing an additional 500,000 tons of cereals each year, which can help feed 2.5 million people, according to some assessments. Tony Rinauld, a natural resources adviser at NGO World Vision, says participating farmers more or less doubled their income from $200 to $400 per year. L’agriculture durable est-elle possible au Sahel ? For years Rinauld worked with farmers who “almost entirely relied on millet in an environment that almost ensured the crop would fail”, he said. Now, if millet fails in a drought, “you have trees to rely on - you can sell the wood, or at least you can get some fodder so livestock can still produce meat,” he said. World Vision and other organizations have encouraged farmers to diversify their crops by rotating millet with cassava and sorghum, and use natural mulch as fertilizer. They have also identified trees and bushes that act as natural fertilizers to save farmers the expense of buying it at market prices. 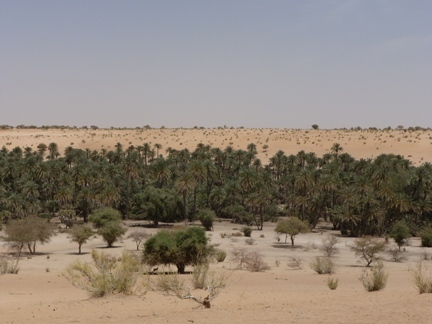 Other methods of regenerating land in arid Sahelian regions include simple irrigation systems such as zaï’ planting pits – small pits used to grow crops and catch water - and half-moon water catchments, according to the Sahel Working Group’s report, Pathways to Resilience in the Sahel. More experimentation with such methods needs to be done across the Sahel, Courcier said. Sahelian zones also need far more investment. “The government's priority is the south where most people live. They can irrigate there, mechanize, intensify - that’s logical, but it’s a problem for the more difficult zones,” he told IRIN. The FAO project has had a significant impact on children’s malnutrition - a 2011 evaluation of FAO’s Bahr et Ghazal wadi scheme noted that acute malnutrition levels dropped by 10 percent among children whose families were involved - but Courcier said it was still “small-scale”. The government has not ruled out investing in the Sahel zone. The Minister of Agriculture and Irrigation, Djimet Adoum, told IRIN in March that after visiting the FAO wadi scheme and agreeing that it should be enlarged, it planned to invest in more irrigation schemes, with significant investment in small-scale farmers. Some 8 percent of the government’s annual budget targets agriculture - just 2 percent shy of the Maputo Agreement, which African states signed to boost agricultural production - but the south is the “bread-basket” (although some four out of 10 households in the region are still food insecure) and the bulk of investment goes into improving rice yields in the south, the minister said. Once governments see the results of investment in agriculture in arid areas, they will engage more deeply said Rinauld. World Vision’s agro-forestry and natural regeneration schemes are now running in eight countries, including Chad, Senegal, Ghana, Mali, Niger, Uganda and Ethiopia, and hopes to open in other East African countries soon, he said. The Kenyan government recently passed a regulation that farmland must have 10 percent tree cover; while the Ethiopian government said it wishes to replicated World Vision’s project on 15 million hectares of land. The energy and commitment of farmers can also help such projects to flourish - in Niger the acreage that has been ‘re-greened’ far exceeds the amount supported by World Vision. The Africa Re-greening Initiative and IFAD are both investing heavily in agro-forestry. “I’m very encouraged,” said Rinauld. The Sahel “will never be a region where it is easy to live - the population has grown, the capacity will always be relatively small, and solutions will always be limited,” said Courcier, but that doesn’t mean people should give up on it.